Hurricane Harvey swept across America last week when more than 50 inches of rain fell in a week on America’s fourth largest city, Houston, Texas, which has a population of 2.3million people. London would normally expect around 25 inches per year so this was an extra ordinary event, even for a tropical storm. The Sunday Times reports that around 185,000 homes were damaged or destroyed and around half a million vehicles wrecked. Tragically, 14 people have lost their lives although this figure may rise when the waters recede and the full extent of the damage becomes evident. Although the loss of life is regrettable, in comparison with less developed countries where around 500 have died to floods in Sierra Leone, Africa and around 1200 have died as a result of Monsoon floods in India, South Asia, the death toll is relatively low. The areas, conditions, climate and geography of the 3 distinct places over 3 continents will all be different as to how the combination of factors led to excessive rainfall in such a short time period. The much lower death toll may be down to better forecasting and awareness of the danger, communication / transport systems to enable people to evacuate. Also the stronger infrastructure where building although damaged may not have been so prone to collapse, will enable a speedier clean up and repair. The climate has always changed, but, media reporting of disasters can give the impression that natural disasters are more common today than in the past. Attached is a graph which provides some historical perspective on this. Houston is no stranger to Tropical Storms having experienced Allison in 2001, Rita in 2005 and Ike in 2008. 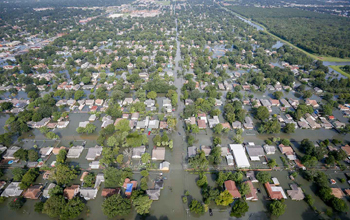 A 2012 report on the infrastructure of Houston acknowledges that in the past measures to reduce the risk of flooding had been limited and inadequate but there was a proposal to change this and address the issues of infrastructure but that more funding would be required. With the best plans in place, there is always the possibility of a rare combination of conditions having an unexpected impact that overwhelms the present defence barriers. As nature continues to throw greater challenges to cities and the urban environment, so must governing bodies have more plans in place to defend cities, people and property whether in the form of dams, overspill reservoirs to divert excess water or underground storage containment? Just as the Romans were early pioneers of drainage and the control of water systems so must the governing bodies of today ensure that resources are in place and that creative solutions are in place to minimise the damage and inconvenience when the forces of nature become destructive. It is much more intelligent and considered development with no short cuts on infrastructure that we need to build the cities and homes for 21st century citizens.